Jomtien Beach Condominium S Buildings - Pattaya rentals long term or short term lettings - Pattaya condo rentals long term or purchase! Jomtien Beach Condominium S Buildings are located opposite Jomtien Beach and boast a fantastic salt water swimming pool for residents to take advantage of. Purchase a condo at Jomtien Beach - Prices start from 1.85 million Thai Baht. Pattaya condo rentals long term - starting from 15,000 Thai Baht per month. We have a great selection of apartments, including studio condos, one bed, two bed and penthouse suites, many with fantastic sea views. Pattaya rentals long term or short term lettings available - condo loans and finance options available helping you to purchase your property. massage parlor, shops, restaurants and bars. Jomtien Beach Condominium S1 and S2 buildings form a very popular condominium complex in Jomtien, located between Soi 10 and Soi 11, with very efficient and friendly maintenance crews keeping the buildings well maintained and clean. There are an abundance of restaurants, bars, shops, markets, massage parlors, beauty salons and entertainment venues in the area so you will never be bored! 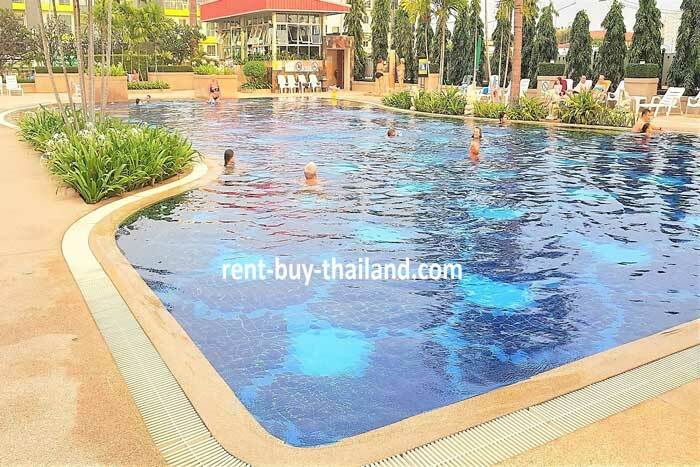 Pattaya condo rentals long term tenants have the chance to own their apartment with various flexible payment plans on offer, why rent when you could own ? Jomtien is a quieter beach area to the south of Pattaya, and boasts 6 km of sandy beach, ideal for walks on the beach or for relaxing on a beach chair - where beach vendors will serve you drinks, food and fresh fruit. You can also enjoy many water sports along the beach, such as scuba diving, wind surfing, banana boating, jet skiing and deep sea fishing to name a few. There are also two night markets in Jomtien - Thepprasit Night Market is held every Friday, Saturday and Sunday evenings and well worth a visit as it is one of Pattaya's largest markets with many stalls offering a variety of traditional market wares and a large food area where you can sample a huge range of delicious authentic Thai street food. The other night market is located on Beach Road and is open every night; it is popular for its many cheap food stalls as well as for offering a variety of clothing, foot-ware, accessory and souvenir stalls. Jomtien Beach Condominium S Buildings are a great base from which to explore Pattaya and the surrounding areas, with many attractions such as Nong Nooch Tropical Botanical Garden, Pattaya Floating Market, the Sanctuary of Truth and numerous golf courses. From Jomtien Beach Road just 10 baht you can take the baht bus into Central Pattaya, which offers a variety of shops, restaurants and bars, a vibrant night life, including the famous and popular Walking Street, and plenty of tourist attractions to keep you entertained. There is also a 4 km stretch of sandy beach with many beach chairs and vendors from whom you can purchase food and drinks; the beach offers a host water sports and trips by speed boat, or ferry from the nearby Bali Hai Pier, to the nearby scenic islands such as Koh Larn (Coral Island) with it's white sandy beaches and crystal clear waters, which provide excellent opportunities for snorkeling, and a chance to explore the island and find all of its fabulous beaches. If you want to explore further afield there are many travel agents offering a variety of excursions to attractions such as Angkor Wat in Cambodia, Bangkok, Erawan National Park and the Bridge over the River Kwai to name a few. Short term rent or Pattaya rentals long term available in Pattaya and the surrounding areas - house for rent Pattaya or purchase property!